Maria B. Winans is the Global Chief Marketing Officer for IBM Watson Customer Engagement. She is responsible for managing all aspects of global marketing, strategy and execution for solutions that enable business leaders in Marketing, Commerce and Supply Chain disciplines to leverage data, analytics and cloud to build deeper, more valuable engagements with their customers, partners and suppliers. In this role, Maria leads a global team responsible for brand awareness, campaign design, digital engagement, content marketing and market development. She is also responsible for the stewardship of what the Watson brand represents, ensuring a consistent and positive experience across all touch points. Maria has been with IBM for 25 years and has held key executive positions in a variety of disciplines and brand units across IBM. These have included key strategic initiatives for IBM such as Smarter Commerce and Smarter Cities as well as leading teams across Business Analytics, Collaboration Solutions, Mobile, Industry Solutions, PC Company and IBM Latin America. 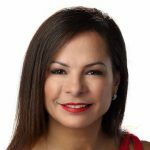 She is a member of IBM’s Hispanic Executive Council, IBM’s CMO Council and helps to lead IBM’s Super Women’s Group reaching women professional across the company. Last year, she was awarded the ASPIRA Association’s Corporate Leadership Award, one of the highest honors given by this Latino organization as well as was named one of the Top 10 Corporate Latina Executives of the Year by LATINA Style. Maria was born in Santiago, Chile and grew up in the United States since a young age. She is a graduate of the University of North Carolina at Chapel Hill, a certified fitness instructor in kickboxing and Russian kettlebells and lives in North Carolina with her two children.